I finally got my hands on a pair of the “new” 5.10 Dragons last month and they blew my mind. 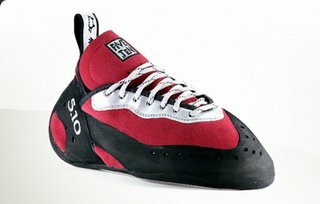 I have pretty much always been a 5.10 addict and I have had basically all of their “high performance” shoes: Anasazi Velcro, Lace-ups, the regrettable Mesas, V10 (old and new) and others. After years of tinkering with the original Velcro Dragons and the 2 different versions of the V10’s, 5.10 really crushed it with these new shoes. The Lace-up Dragons perform spectacularly both with and without the laces tied! I was surprised to feel how powerfully my foot was positioned simply by putting it in the shoe and leaving the laces undone (tying laces increases my pump). The one common complaint that I was able to confirm was that the laces are really ridiculously long and you will have to come up with a comfortable system for lacing them (or just don’t lace them if it’s too much work). I haven’t been able to climb in them as much as I would have liked but my first impression is that the Dragon is really quite versatile despite the radical downturn in the toe. I felt very solid climbing on thin face climbs while also seeing the obvious high performance on steep roof climbs. I did feel like my foot began to sweat sooner than my Mocasyms but that might just be a personal problem. As for sizing, I will give you a run-down of my street shoe size along with my size in various 5.10 shoes and you can take it from there (all sizes are US). Compared to how I have sized other shoes and the fact that the lace-up design makes it easier to get your foot in a shoe, the Dragon’s are really quite comfortable for how much performance they offer. Overall Grade: Go get a pair today! I have a pair of the Five Ten Dragons. I don’t agree with the sizing chart here. I am a solid size 12 wide street shoe. I have struggled to break in my size 14 dragons – painful. I know they are better when firm and I have had other climbing shoes. I would suggest trying these on in a store. They need to be tight, but I suggest going up two sizes (at least)and sticking with it when breaking them in. It obviously will vary from person to person so trying them on yourself is always the best idea. I have very narrow feet so that might have something to do with the difference as well. I know Paul R wears them like 3-4 sizes below street shoe size so it can vary widely. i bow down to thee one and only sock hands for everything regarding rock climbing and life in general. It’s too bad your ankle had to bow down to sock hands’ ankle and break itself! ALL respectful ankles break in celebration and awe of me in hopes of finding a more divine path!! !